One can only say extraordinary! Wonderful poem, well done! Thank you. 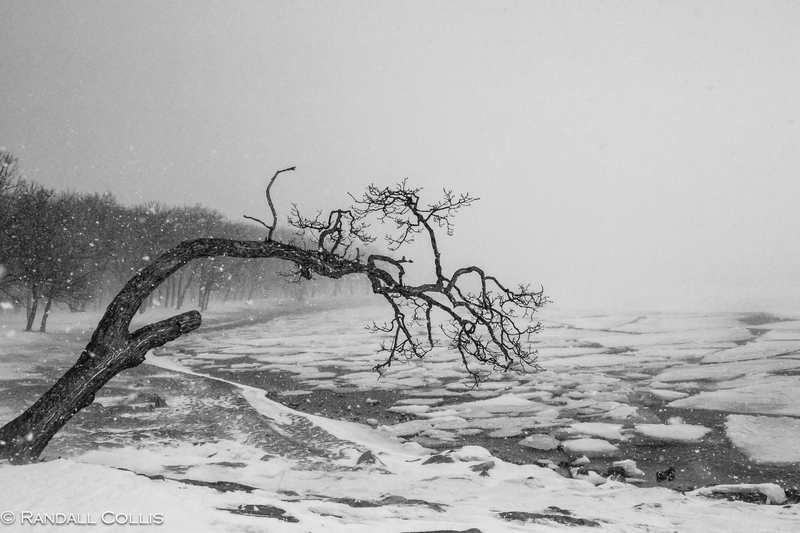 Oh, I do love experiencing winter – in photos. Probably explains why we live in Florida. 🙂 Your images are exceptional and they almost tempt me, almost. Lovely post Randall. Yes, I do love the winter season…but knowing that I have a place warm to go (HK for me, FL for you) makes it a bit better when visiting such winter-wonderlands. 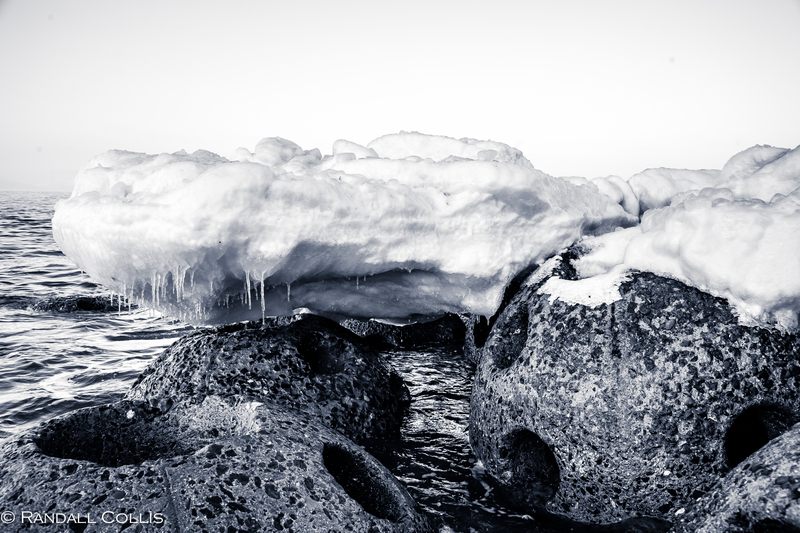 Such beauty in the midst and the winter which I am tired of! This winter is one for the books, I keep thinking Spring is around the corner… Thanks Anne. We have 15 inches of snow on the ground with piles higher than cars. 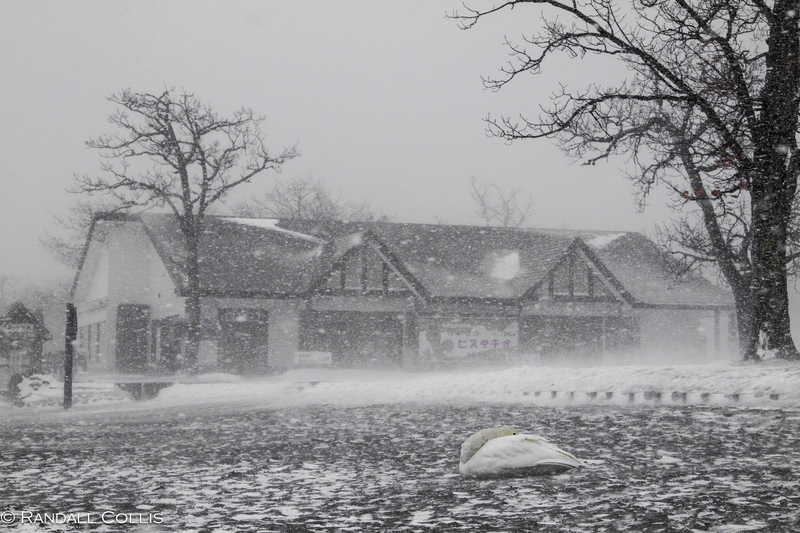 I can’t remember a winter like this for years and years! Agree, and I think you could do that well 🙂 Thank you Dedy! Wow! You have showcased some AMAZING work! Thank you Rachel, it was an amazing environment to shoot in. Cheers! On 2/11/2014 my friend DawnSeeker (journalofdawn.wordpress.com) gave me a link to http://dalocollis.com and I found a new friend who gives very much to everybody. Thank you, Randall Collins. to put it simply, I’m … speechless… stunning work!! 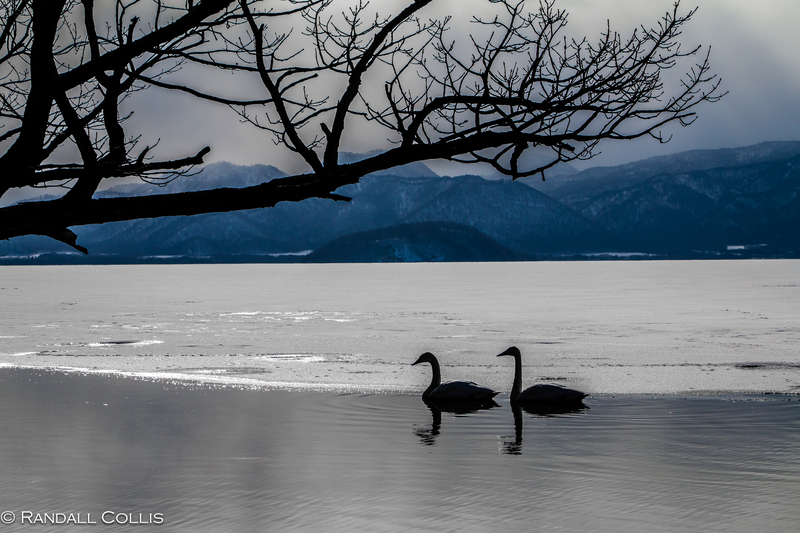 The trip to Hokkaido in the winter blew me away, it was so peaceful/beautiful/perfect for photography and for just getting away. Thank you! Wow, your are a talented artist! AWESOME!!! Hey Edwin, thank you very much! Ahh, yes. The greys and blues…you tell a fine story of truth. I like seeing both sides. There isn’t enough of that, if you ask me. Do like the greys and blues at times ~ a good part of life, mainly in knowing that sunny days are on their way! Sun is here and alive in Texas already. 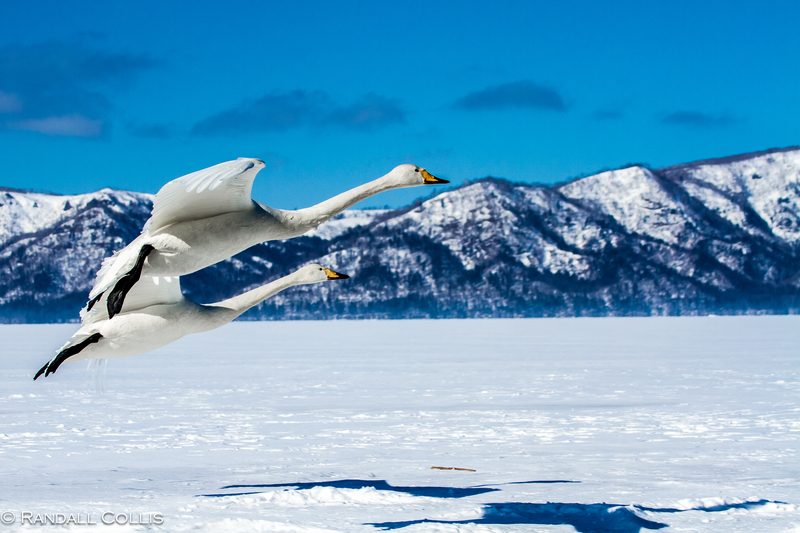 My favourite photo was whooper-swan-hokkaido-lake-mashuko-japan-8.jpg, the stupid looking thing made me laugh. He definitely looks proud of himself! That was a genuine LOL moment right there! Now I have the funniest mental image. Someone should take a photo of that and put it next to the one of the proud bird. Just looking at some of your posts and this one caught my eye. What immediately hit me is how you capture pictures with feeling in them. Not just great photos but photos that for me evoke emotions – happy, free, moody, funny, and more. A great talent you have. Thank you Jude, that is a wonderful compliment, I think photos that can evoke emotions are special ~ especially if a simple shot. Cheers! 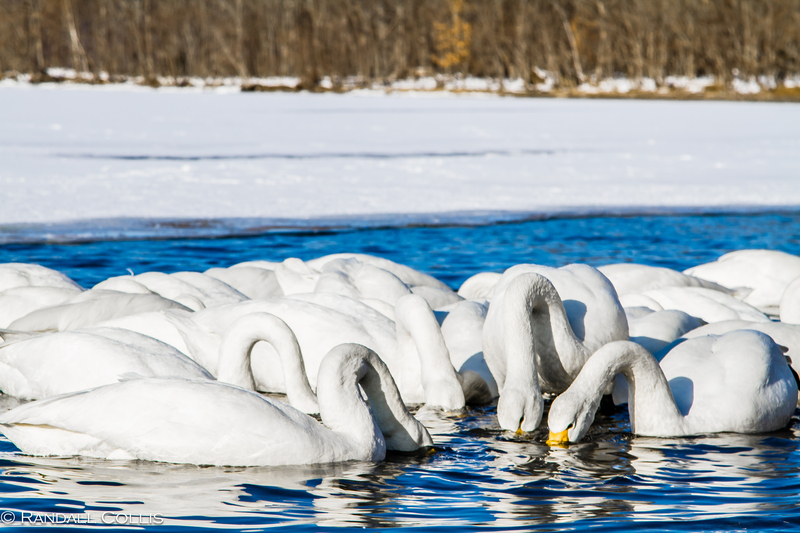 I loved the action you got with the swans – it really gives them character. Thanks, it was a fun shoot with all their activity ~ they had character in abundance. Beautiful pictures of winter! I love the perspective and the rendering choice of the second picture! 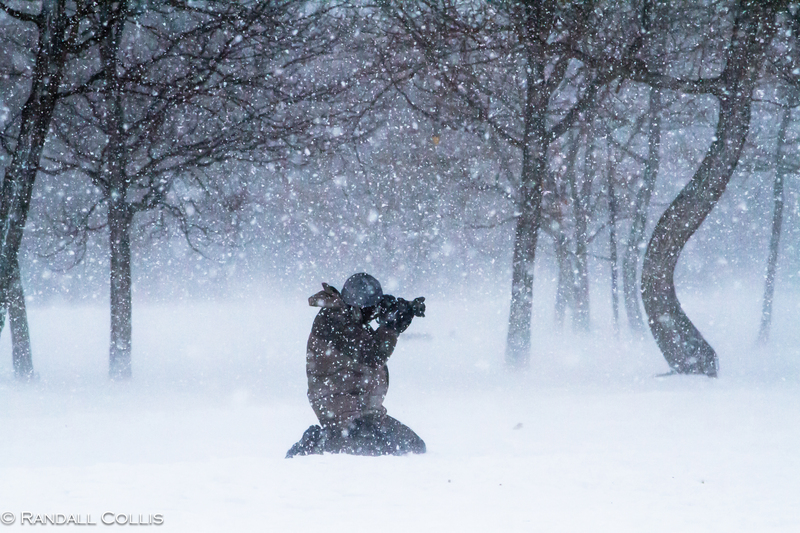 Thank you (that is one of my favorite shots…solitary strength in the mist of a blizzard). Wow! What a beautiful set! Enjoyed shooting this set quite a bit. Thanks. Thanks, really a fun shoot ~ great subjects. Thank you Takami, my visit to Hokkaido was amazing…and I hope to visit there in the summer as well (to see if differently than in winter). A magical place. Your photography is so divine! as the swans drink, spirits among the trees look on…one human the other I felt was an owl? 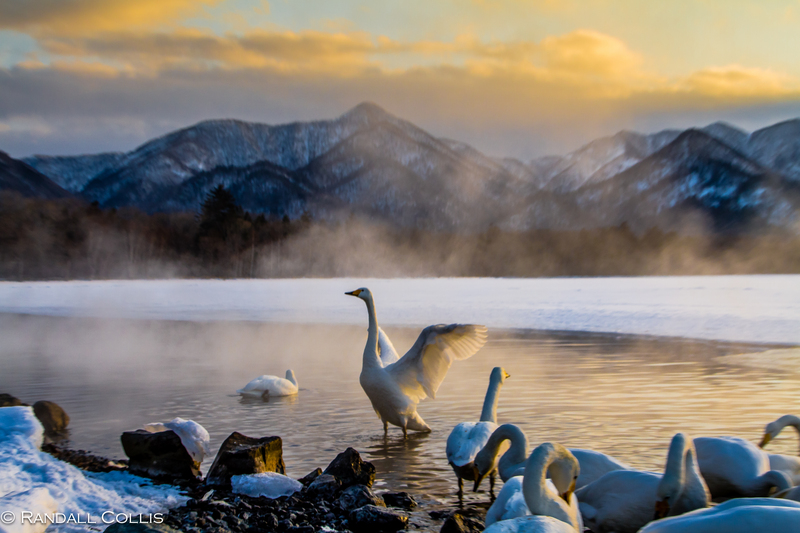 The waters the swans dance on are the most amazing blues…. Thank you, it is wonderful to hear your thoughts and insights into winter. With all the wildlife around, never a dull moment ~ yet so peaceful. Oh my goodness, I’ve missed so much of your work! This is, just, well, made me feel cool in the midst of 95 plus degrees. The landscape monotones are luxurious. I’ll have to go back and review your stuff 🙂 I love winter! Great point, revisiting this post can fool the mind into thinking a crisp, cold breeze of winter is sweeping over us! Thank you and wish you a cool week. We are still months away from winter, but when looking at your gorgeous photos I start to long for the winter season again. But it takes a lot of work and stamina to capture photographs like these. 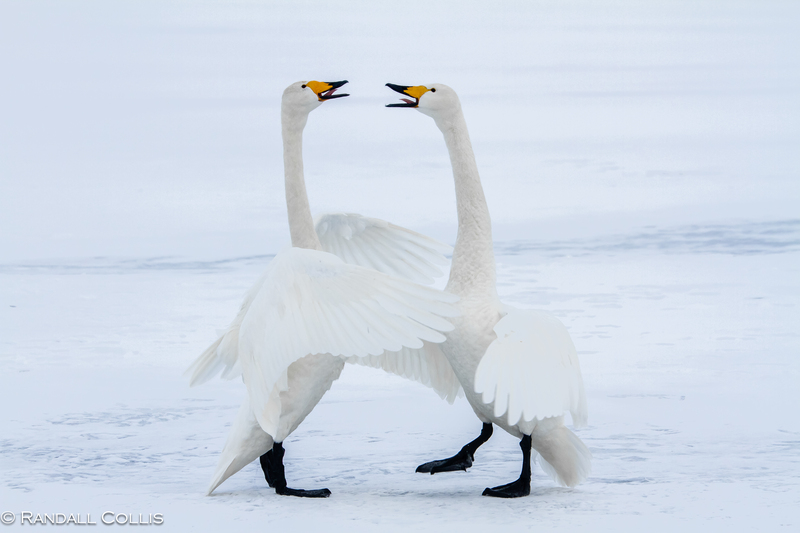 The swans are perfect, playful and full of natural joy, despite the cold weather. 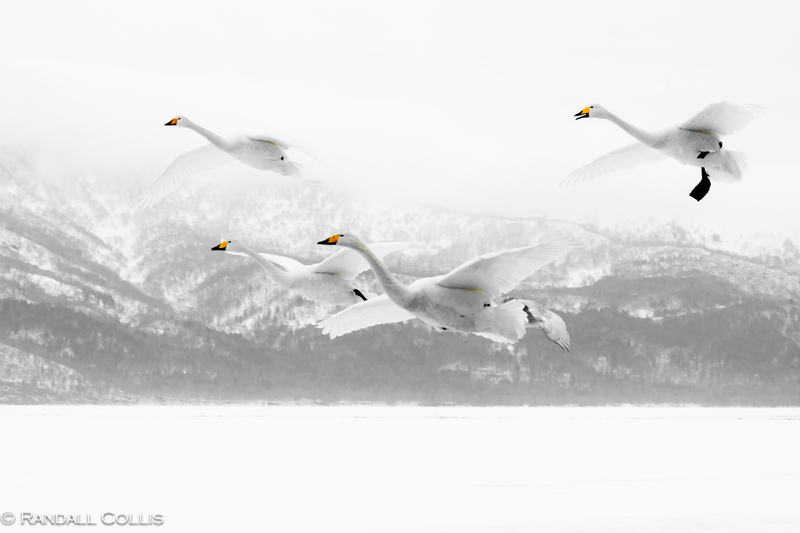 Stunning capture of the swans! 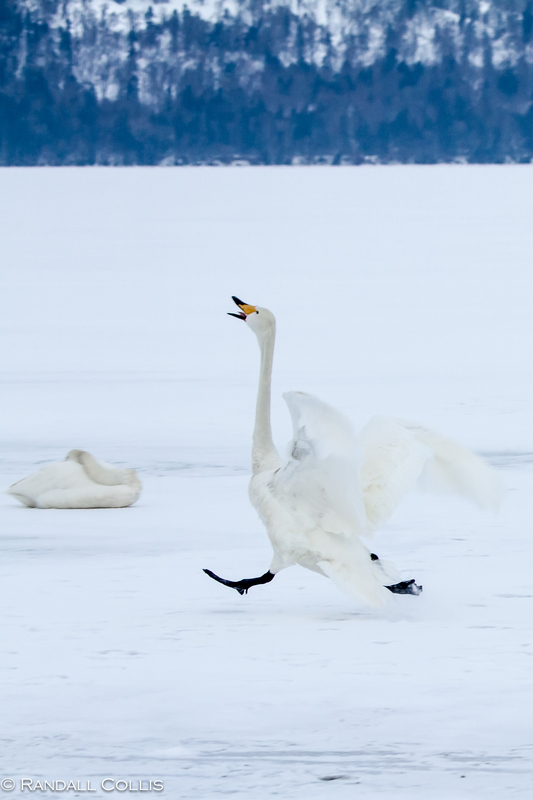 As you say, they do seem to bring an air of fun to the chilly surroundings, especially the one calling and strutting off to adventure. 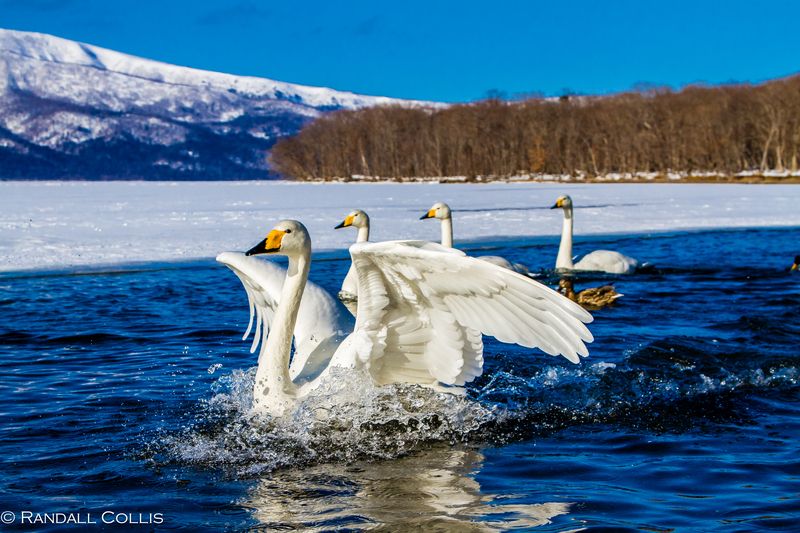 Are the swans a steady fixture in Hokkaido throughout the seasons?